Today’s Think Kit prompt: What did you make this year? Whether something personal, like a song or some art, or a work project, share your process, the end result about your creation. I’m not sure what came over me this year, but I feel like I have became sort of domesticated. All of the Pinteresting I have been doing has caught up with me and I finally got the motivation to do something with it. I will admit that the first Pinterest project that was completed from my boards was actually done by my boyfriend, and to be honest, he’s better at all of the DIY stuff. But I can at least take credit for the idea, right? In the spring, I had the great idea of starting a garden in the backyard. We live on almost an acre of land, so we have plenty of room to do some urban farming. Naturally, I started a Pinterest board full of garden ideas…everything from what we should plant to cute decorations for our yard and garden. After I did my Pinterest research and decided that I was an expert in gardening, I figured we could just go buy the seeds and get to work! But being the ying to my yang, Ryan put the brakes on my impulsive east-side garden until we had all of the necessary information, tools and plans. So we took things slow and did the garden the right way, starting with getting about 40 pounds of organic dirt brought in and tilling the area planned out for the garden. Not wanting to strain myself, I went ahead and let the men take care of this part of the garden while I sat inside and caught up on the newest episode of Real Housewives of Orange County. I was also starting to learn that gardening wasn’t just a cute and dainty hobby…it’s hard work! 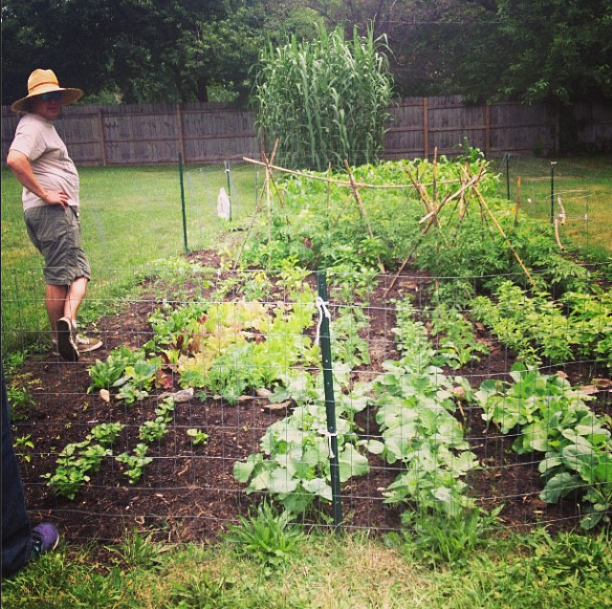 We bought all of the seeds from an organic store in Westfield and planted them in our 40×15 foot backyard garden. We tried to do a variety of vegetables and herbs including corn, peppers, jalapenos, tomatoes, lettuce, kale, broccoli, brussels sprouts, zucchini, squash, carrots, basil, sage, cilantro and more. We even planted an “overflow” garden that had pumpkins, strawberries and sunflowers. 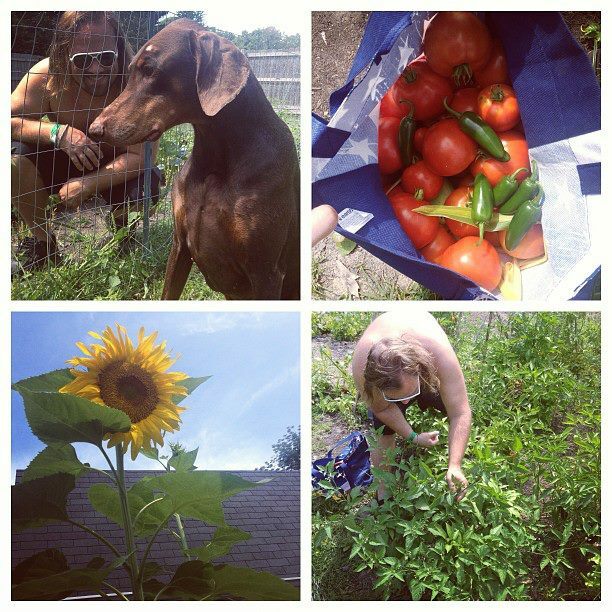 The garden was followed up with a set of rain barrels attached the garage so that we wouldn’t spend a fortune on water. Just in case my boyfriend happens to read this, I’ll put a disclaimer out here that he did most of the manual labor for all of this…but I like to think that I was a great copilot, reading directions and overseeing operations. After a couple of weeks, our garden came to life. The corn started growing tall and we were eating salads with fresh lettuce and veggies almost every night. My new go-to appetizer was stuffed jalapenos, since we had handfuls of them sprouting up. Then, tomatopocalypse began. The tomatoes started growing so fast that we couldn’t keep up with them. We were harvesting dozens and dozens of tomatoes every week, and so began my canning adventure. I bought all of the supplies for canning along with a how-to book and started canning our tomatoes and peppers into jars of salsa. Then I moved on to gathering bags of basil and making it into pesto. It was pretty late into the season when I started canning, and I was working a serving job at night at the time, so I didn’t get to can as much as I would have liked. We had a lot of produce go to waste, but it was all a learning process. I can’t wait for spring to roll around so that we can improve our garden and stock up on homemade canned goods. Maybe next year, I’ll even get my hands dirty. 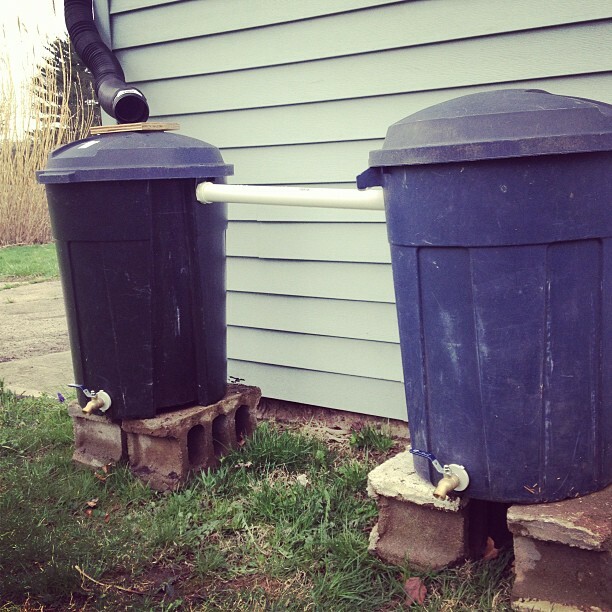 Tags: canning, gardening, rain barrels, thinkkit, Tomatoes, urban farming. Bookmark the permalink. This is amazing! I have always wanted to learn to can stuff from my garden. Maybe next year will be my year. Did you discover any great stuffed jalapeño recipes? I mostly stayed on track of cutting them in half, filling with goat cheese, cream cheese, some kind of cheese, and then adding in crumbled sausage or bacon…I guess I could get more adventurous instead of just changing cheeses and meats!